The minister for transport introduced regulations over the Christmas holidays clearing legal obstructions which had forced Dublin City Council to keep bicycle traffic lights on the route switched off months after they were installed. Previous regulations did not permit the smaller size and sequence of the new lights. The 3.6km route starts at the Royal Canal in the North Docklands and brings cyclists via Grand Canal Square and along the Grand Canal to Portobello. The council said it is hiring UK safety consultants to monitor the untested miniature lights and unique traffic sequence. The new eye-level bicycle lights are to turn flashing amber for cyclists while pedestrians have a flashing green light. Cyclists are expected to yield to pedestrians while the lights are still flashing and those using the route must obey the bicycle light rather than the normal traffic lights. See video below. Uniquely in Ireland for a two-way cycle route alongside roads, cyclists are at most road junctions separated from motorists and pedestrians – this led to the need to have separate lights for cyclists avoid conflicts with pedestrians and motorists. “It has been agreed [between the council and department] that this sequence can be trialled and a methodology for assessment by the independent Transport Research Laboratory (TLR) in the UK has been agreed. This will take place once the Canal Waycycle route has been opened and the signals turned on,” said a spokesman for Dublin City Council. While the traffic lights are not working, most of the route is already being used by cyclists incorrectly using the general or pedestrian traffic lights. Sources with knowledge of the project claim that a dispute between the council and the Department of Transport over the lights stalled a plan to part-open the route last year. However, the council said there was no dispute citing the law change of evidence of this. The department did not respond to requests to comment on this. The delay in turning the traffic lights on is among a line of problems to hit the controversial project which was criticised for its high price tag of over €1.61 million per kilometre (see why here) and the removal of parking spaces for its construction, and was cut short after objections. The council confirmed that the project which was due to open last September will miss a revised completion date of December 2011. A spokesman said it will now be officially opened in March and estimated the final cost at EUR5.8 million. The route is eventually to be part of a continuous network of off-road cycle tracks stretching along the canals and from Sutton to Sandycove along Dublin Bay. 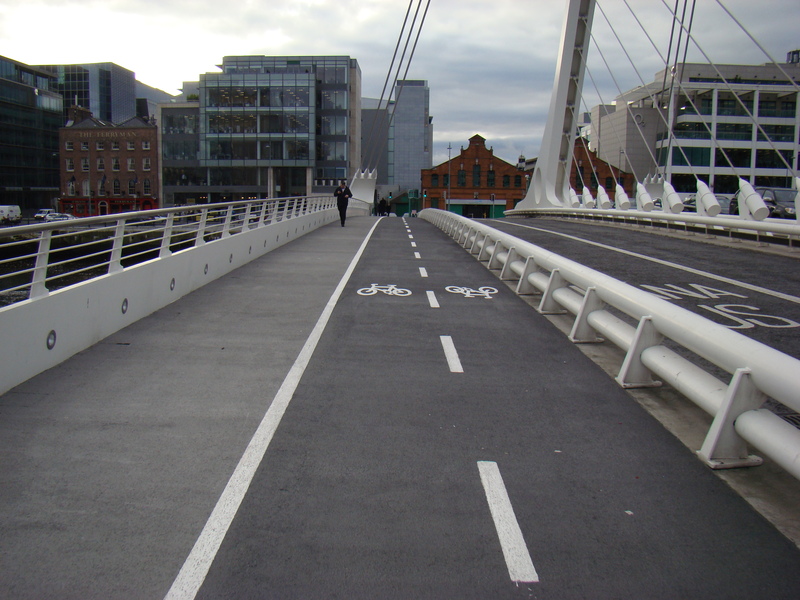 Dublin City Council, with the support of the National Transport Authority, is currently finalising plans to upgrade the city’s cycling network. The most controversial route under consideration — and committed to in the city’s development plan — is a two-way cycle path along the north quays, which would require major diversions and possibly converting the south quays to two-way for general traffic. It would be helpful if large bicycle symbols were painted on the ground at these junctions. Pedestrians are still wandering zombie-like onto the bicycle lanes. There’s still some ongoing work — including some signage and markings on the more finished looking sections. It is still not officially opened. There’s a good argument that it should be physically closed off with barriers until it is so to limit the amount of cyclists and pedestrians getting into bad habits of breaking lights or walking in the wrong places. More madness,north quays two way cycle lanes & south quays two ways. The council has lost the run of itself and cant distingush between private cars and delivery vehicles,mini buses,coaches and Taxis all are needed to make a city centre function. The cycle lobby has too much power. As far as I know, there’s no plan to ban any of the forms of transport you mentioned — the city will still have all of them. The council have said any plan would have include access for all. The proposal comes from a commitment in the city’s development plan for a cycle route along the quays — this was agreed among the city’s councillors. It would be great if this pleasant separated cycle route continued along the bank of the Grand Canal to Harold’s Cross, Dolphin’s Barn, Rialto and Inchicore, instead of being cut off in its prime at Rathmines. There are plans to extend the route — the plans for it are to go to public consultation soon. We should be covering it in a news story soon.